For many years, one Kauai’s must-do activities has been to take a guided boat trip up the Wailua River to see the Fern Grotto. 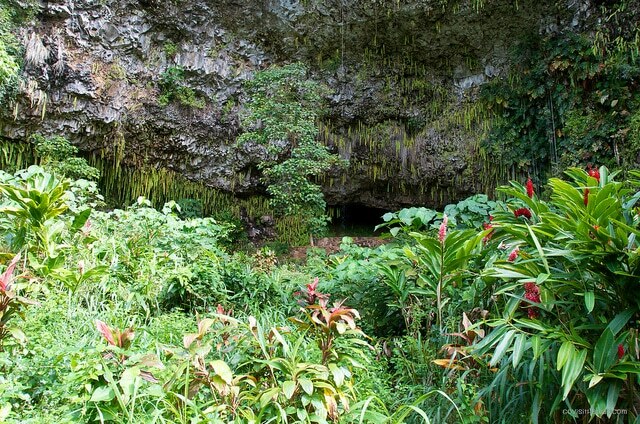 The Fern Grotto is a shallow cave near the base of a fern-covered volcanic mountain. The area has been a famous wedding site due to its natural, cathedral-like setting and acoustics. Unfortunately the grotto ain’t what it used to be. Flooding from heavy rain has damaged the grotto over the years. The most recent set back was in 2006 when the area received rainfall for forty consecutive days. Flooding destroyed the dock, walking path and washed away many ferns. With that damage, the site was closed for several months for repairs. When the site was reopened in 2007, one of the biggest changes is that visitors are no longer allowed to walk into the shallow cave. Visitors are only allowed to view the cave from several yards away on a platform. Read more about the 2006/2007 changes here. We took the Smith’s Fern Grotto Tour earlier this year. The river boat tour departs from the mouth of the Wailua and travels approximately three miles up the river the Fern Grotto landing at Wailua State Park. Live music and hula dancing was provided on the boat trip to the park. From the park landing, a short paved path through lush tropical plants leads a platform a several yards from the famous grotto. The tour guides played and sang the Hawaiian Wedding Song from the platform. On the return boat ride back, commentary about the history of the river area was provided. 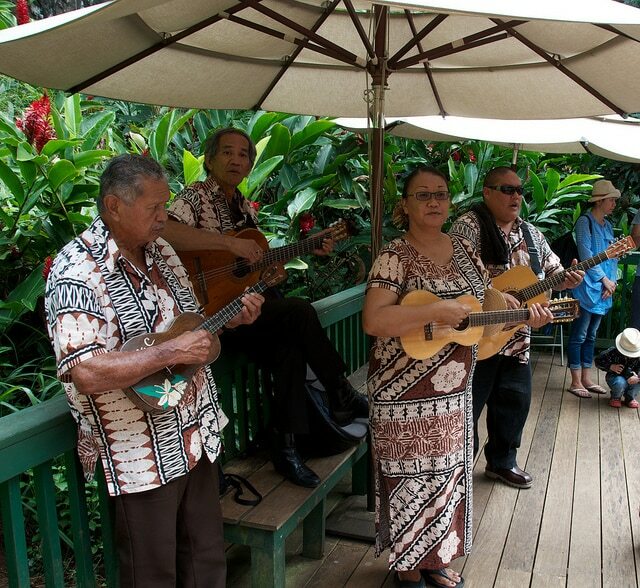 The guided tour includes a performance of the Hawaiian Wedding Song at the grotto. The following video provides a quick glimpse of the grotto as well as a listen in to the tour guide’s commentary. If you’re not kayaking the Wailua river, this guided Fern Grotto tour provides a less strenuous, dry scenic trip up the Wailua River. For the money, approximately $20 for adults and $10 for children, this tour provides good value. – The entire tour takes one hour and twenty minutes. – The boat is quite stable and covered. – The path is wheel chair accessible. – This tour tends to appeal to a more mature crowd, though it’s a great little trip for kiddos, too. – This tour currently costs $20 for adults and $10 for children. You can save $2 per adult ticket and $1 per child ticket by booking online. – This tour operates seven days per week. With several morning and afternoon trips. – We recommend wearing good walking shoes with traction as the trail may be slippery when wet. – You may want to have mosquito repellant on hand in case you need it at the state park. – As always, we recommend you wear a hat and sunscreen while you’re outdoors in Hawaii. – See more photos from our tour of the Fern Grotto here. Have you been to the Fern Grotto? How was your experience?